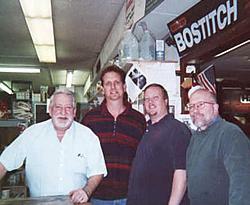 We have a very knowledgeable staff including (from left to right in the photo) Dennis(me, the owner), Bob, Mike and Tim. I have been in the business for over 35 years. Mike has been in the business for over 12 years. Tim (a floor sander) has been in the business over 28 years before retiring and joining our staff. Also, we employ drivers and a shipping manager to make sure all of your deliveries are shipped on time and correctly. Mike and Tim are in charge of the wood department (pricing and shipping). Bob handles the paint department and does all the custom matching (The best I've ever seen.). We ship all over the world. Also, we service over 1,000 floor sanders. By now, you are wondering what do they need me for???? I own the business and they can't fire me. We sell all kinds of finishing supplies, tools, machines (including repairing them) and we can give you quotes on flooring. Our hours are Monday thru Friday from 7:00 am to 5:00 pm and Saturday form 8:00 am to 4:00 pm. Sunday we rest. By the way, we are still in the paint business. Copyright ©2000 - Niles Color Center, Inc. All rights reserved. Do not duplicate or redistribute in any form.